This edition published by Stabenfeldt 2007. Originally published earlier. Cam lives with her large family, helping out with her parent’s market garden farm. She dreams of a beautiful grey stallion but there is little money to spare and she knows she is not going to get the horse she longs for. She shares her best friend Lacey’s pony Speckles but it’s not the same as having a pony of her own. She also feels very left out when Lacey tells her she has joined a local riding club. One day she rescues a horse which is caught in traffic. It’s the ugliest looking and most unkempt horse she has ever seen. When its owner, Mr Barnett, arrives he tells her the horse is stubborn as well as ugly, it used to be his daughter's horse but since she has grown up and left it has been abandoned in a field for 2 years. He threatens to send the horse to slaughter and Cam finds herself buying the horse for 2 cents! Even if he is not up to much she thinks he may be her ticket to joining in the riding club with Lacey. Her parents, after the initial shock, allow her to keep the horse, which she at first christens Plug Ugly! After a lot of veterinary care and attention the horse starts to look better. But he is, as Mr Barnett said, stubborn and unmanageable to ride. Cam still hankers after her dream horse. But after a telling off by Lacey in which she is given a few home truths, mainly about how she doesn’t show any love or affection for the poor horse and that this may be what is causing the problems, she feels guilty. She realises that he has been abandoned by his previous owner and now is still not receiving any affection from her either. She resolves to care about him more, and soon finds he is loveable after all. He also becomes much better to ride when he has Speckles for a friend. He is rechristened Galahad and now even lives up to his name! Cam has learnt that dream horses are all very well but the real thing, no matter if not perfect, is what is important and should be cherished. But just as she realises this, the prospect of losing him looms. Cam owes a huge amount to the vet and her parents can't really afford to keep feeding Galahad. It looks like she may now have to sell her horse. Will she be parted from Galahad just when she has learned to love and appreciate him? Just a short review here due to time constraints, but thought it worth mentioning this book as it is one of the better modern stories I have read. It is an extremely traditional story which in its bare bones could easily have been written in the 1940s or 50s. There is very little of the ‘teen’ element, romance, or the like. At the heart of the story is the relationship between girl and horse and (as with all the best horse stories) the transformation of the girl’s character as she learns to appreciate what is important in life through looking after her horse. The story is satisfying and although traditional is not boring or staid. What is also nice is that Galahad is not suddenly transformed from an ugly duckling to a swan. 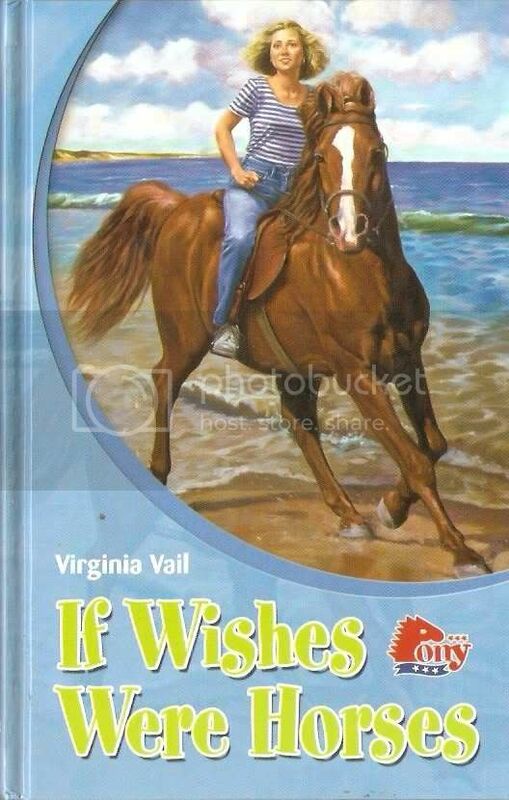 He doesn’t miraculously turn into a dream horse, which could have happened in a less interesting story. He still has faults, but by learning to accept these faults and appreciate that reality is not perfect, but can still be loved and cherished, warts and all, Cam grows as a person. The message that dreams must be put aside in favour of reality is not negative at all. It is not about giving up hope, instead it is all about making the best of what you have and even perhaps realising that reality is actually better than the dream. Our heroine is mostly sympathetic but not too goody goody. Her motives in rescuing the horse are not completely altruistic as one of the reasons she takes Galahad on is that she needs a horse to join in with the riding club so she will not feel left out. But her flaws, like Galahad’s, make her more believable a character, even if at times we may get a little annoyed at her. Her change in attitude as she comes to care more for Galahad make us gradually more and more sympathetic to her, so that by the end when she faces losing her horse we care very much about the outcome. All the other characters are believable too, including that of the horse who is not two dimensional at all. There is a nice sense of interaction between the various characters, especially the members of the family. The family life is realistic and forms a nice backdrop to the story. The book is very easy to read and well-written, and the narrative pulls you along nicely. The ending is perhaps a tad contrived and can be seem coming a mile off, but at the same time it is satisfying and ties things up neatly. All in all, this is a very nice pony story which although modern, holds it own against a lot of older traditional pony books. Although it is in no way a classic, it is a very good example of what can be done with a modern pony story, and is a thoroughly engaging and enjoyable read. This book was a nice surprise for me, with a more complex set of problems and better characterization than I expected. Fairly strong sense of place and community, too. Great review -- good analysis of the book's strengths and weaknesses! Agree it is not a 5-horseshoe read but a solid 4-horseshoe entry and worth looking up.